Ditch Your Cell Phone for $100,000! Are you ready to give up your smartphone? What if someone paid you $100,000 for one year of no cell phone? Well, that’s what Vitaminwater is doing. It’s willing to pay one person $100k if they can go one full year with no cell phone. If they make it six months, they get $10,000. 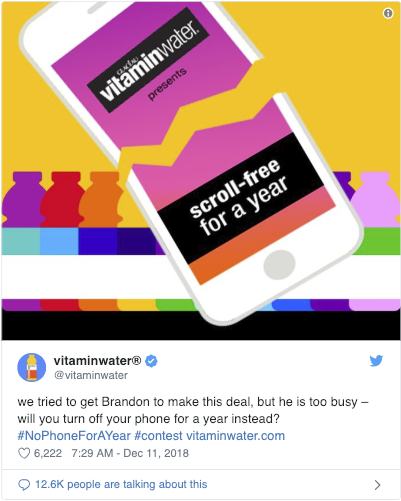 Vitaminwater is making a case for healthy living, as well as breaking a serious addiction that’s hurting family time and quality of life. But Nomophobia, the fear of being without your cell phone, is strong, affecting 40% of people. Are you willing to give up your smartphone for a year? You have until January 8, 2019 to enter the contest. Click here to read the “Scroll Free” contest rules.